To review this book I borrowed a copy from my local public library. How would you cope if suddenly you could no longer do the job you loved? Luciano Anastansini was born to be a circus performer. It was in his blood. His family had been performers, all the way back to his great-great-great-great-grandparents. By the time he was twelve, Luciano was a famous juggler and acrobat. Life was great until, while performing in Chicago, Luciano fell fifty feet from the high wire. It took awhile, but eventually Luciano imagined a new act: performing with dogs. But not just any dogs. Since Luciano was given a second chance, he wanted to find those dogs that no one wanted and give them a second chance, too. 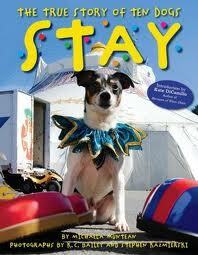 Stay: the true story of ten dogs narrates how Lucanio found his dogs and made them performers. Not a dog trainer, Luciano decided to let the dogs show HIM what they wanted to do. It took patience, dog treats, and a lot of love. Giving brief summaries, the book highlights all ten dogs. The design has each dogs bio placed within their full-page color photo which reflects their personality. We learn about Penny, a Bichon Frise who was returned to the shelter three times because she spun around madly in circles and ran into furniture and walls. Tyke was a Schnauzer with an attitude. He did the opposite of what anyone asked. Bowser, a beagle mix who loved to leap onto kitchen counters to steal food. Bowser could nudge open the cupboards to get what he wanted, bread, butter, it didn’t matter. Each dog's "problem" was recognized as a strength and incorporated into the act. Click here to watch Lucanio and his dogs perform. This fun, nonfiction book will appeal to a wide audience. Give it to students who love the circus or animal rescues, or to those who just love a true story with a happy ending. Some suggestions include, Nubs: the story of a mutt, a Marine & a miracle by Brian Dennis, Kirby Larson, and Mary Nethery, Hachiko: the true story of a loyal dog by Pamela S. Turner, and Little Dog Lost: the true story of a brave dog named Baltic by Monica Carnesi. Fiction titles: The Leanin’ Dog by K.A. Nuzum, Little Dog, Lost by Marion Dane Bauer, and Shiloh by Phyllis R. Naylor. 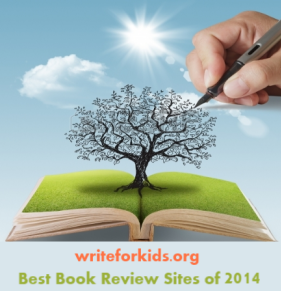 Read an interview with the author, Michaela Muntean on author Sara Albee's blog. I love Muntean's closing line. "Reading is a ticket to anywhere you want to go." So true!